AL-ASAD AIRBASE, Iraq — In a surprise trip to Iraq, President Donald Trump on Wednesday defended his decision to withdraw U.S. forces from Syria where they have been helping battle Islamic State militants. Trump said it’s because of U.S. military gains that he can withdraw 2,000 forces from Syria. During his first visit to a troubled region, Trump also said he has no plans to withdraw U.S. forces from Iraq. He said that Turkish President Recep Tayyip Erdogan has agreed to take out “any remnants” of IS left in Syria. The U.S. presence in Syria was not meant to be “open-ended,” he said, adding that other wealthy nations should pay for rebuilding Syria. “The nations of the region must step up and take more responsibility for their future,” said Trump, who said there would be a “strong, deliberate and orderly withdrawal” of U.S. forces from Syria. Trump’s trip to Iraq came a week after he stunned his national security advisers by announcing the U.S. troop withdrawal from Syria. Trump’s trip was shrouded in secrecy. Air Force One flew overnight from Washington, landing at an airbase west of Baghdad under the cover of darkness Wednesday evening. 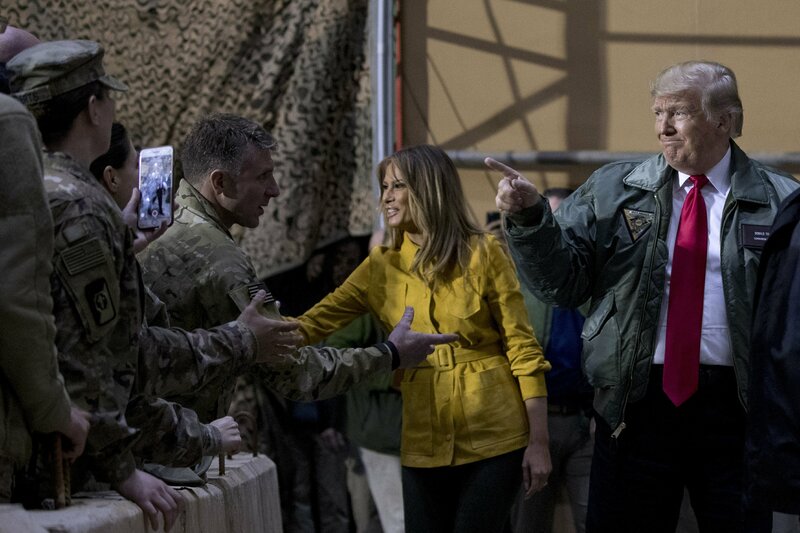 It is his first visit with troops stationed in a troubled region. Trump, who speaks often about his support for the U.S. military, had faced criticism for not yet visiting U.S. troops stationed in harm’s way as he comes up on his two-year mark in office. He told The Associated Press in an interview in October that he “will do that at some point, but I don’t think it’s overly necessary.” He later began to signal that such a troop visit was in the offing. Trump had planned to spend Christmas at his private club in Florida, but stayed behind in Washington due to the shutdown. It’s unclear whether his trip to Iraq was added after it became apparent that the government would be shut down indefinitely due to a stalemate between Trump and congressional Democrats over the president’s demand for a wall along the U.S.-Mexico border. Adding to the tumult, the stock market has been experiencing heavy losses over concerns about a slowing global economy, Trump’s trade war with China and the president’s public slamming of the Federal Reserve and its chairman over interest rate hikes by the independent agency. Trump’s visit comes at a time when his Middle East policy is in flux. He went against the views of his top national security advisers in announcing the Syria withdrawal, a decision that risks creating a vacuum for extremists to thrive. There are dire implications in particular for neighboring Iraq. The Iraqi government now has control of all the country’s cities, towns and villages after fighting its last urban battles against IS in December 2017. But its political, military and economic situation remains uncertain, and the country continues to experience sporadic bombings, kidnappings and assassinations, which most people attribute to IS. His successor, President Barack Obama, wanted to leave a residual force in Iraq to help the government manage ongoing security challenges. But he ultimately went ahead with the scheduled pullout in 2011 after Iraqi’s political leaders rejected terms the U.S. sought for legal protections for the U.S. troops that would have remained. Two of Trump’s recent predecessors visited Iraq early in their terms. Vice President Mike Pence visited Afghanistan in December 2017, not long after Trump outlined a strategy to break the stalemate in America’s longest war. Pence met with Afghan leaders and visited with U.S. troops stationed in the country. Trump has not visited Afghanistan.